– Custer started third and finished third in Stage 1 to pick up eight stage points. – The No. 00 Ford started third and finished fourth in Stage 2 to pick up an additional seven stage points. – Custer started fourth in the final stage and raced his way to the lead on lap 90 and traded the lead with Kyle Busch until lap 94. – The Thompson Pipe Group /Haas Automation Ford returned to the lead on lap 119 and held the lead until a caution on lap 125. – The No. 00 came to pit road for four tires and fuel during the stop and returned to the racetrack in the fifth position after two cars chose to stay out. – Custer restarted fifth with 20 laps to go and immediately raced to the lead where he would stay until the checkered flag. – Custer scored his first win, third top-five finish and fourth top-10 of the 2019 season. – Briscoe started sixth and finished 11th in Stage 1. – The Nutri Chomps Ford started Stage 2 in eighth and finished 10th to pick up one stage point. – The No. 98 Ford started 10th in the final stage and raced as high as third with 30 laps to go. – A caution with 26 laps remaining brought Briscoe to pit road for a four-tire pit stop. – Briscoe restarted eighth after two cars opted to stay out and raced up to the fourth position with 15 laps remaining. – The No. 98 Ford battled in the closing laps and finished in the fifth position. – Briscoe scored his first top-five finish and third top-10 of the 2019 season. 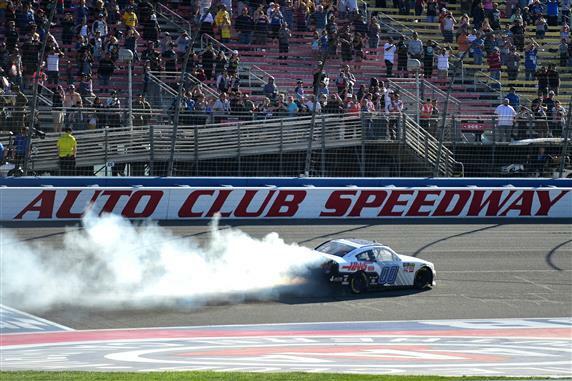 – Custer scored the third Xfinity Series win of his career and his first at Auto Club Speedway. – It is Stewart-Haas Racing with Fred Biagi’s fifth Xfinity Series win and first since Custer’s win at Texas Motor Speedway in November 2018. – The win also marks Stewart-Haas Racing’s 60th overall win in NASCAR. Next Up: My Bariatric Solutions 300 at Texas Motor Speedway in Fort Worth, Texas, on March 30th at 1 p.m. EDT broadcast by Fox Sports 1.